The easiest and quickest way to get your cinnamon roll fix! 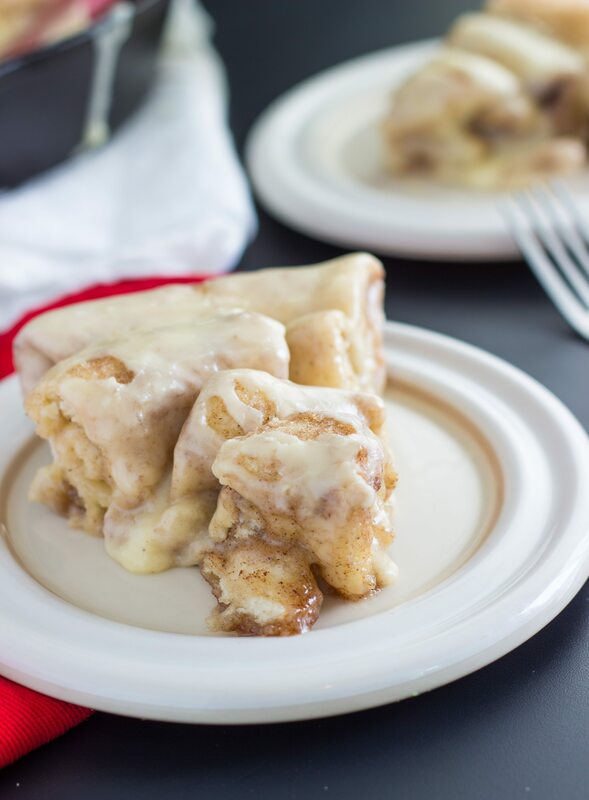 These muffin-sized cinnamon roll pull-aparts can be ready to eat in 20 minutes or less! Well, we are on the road! Our entire home is packed up in the back of a moving truck as we make the trek out to visit family before heading to Australia. It was quite the crazy week getting everything packed up and ready to go, but it’s also been exciting getting ready for this new adventure. We only have about 5-6 more hours left til we can empty our truck into a storage unit (we won’t be bringing too much to Australia) so fingers crossed the rest of the trip is uneventful! BUT it’s time to talk about these cinnamon roll pull-aparts. Remember that one time I said cinnamon rolls had been revolutionized because they took 30 minutes total and were baked in a skillet? I’m back to tell you they have once again been revolutionized! This time they take 20 minutes and are baked in a muffin tin and these are UNBELIEVABLE! But before we get too far, these aren’t traditional totally doughy cinnamon rolls. They are closer to a miniature form of monkey bread, but they’ve got plenty of cinnamon + sugar and a delicious cream cheese frosting just like cinnamon rolls we all know and love. Plus they’ve got the dough, it’s just already made. That’s right, these start with store-bought biscuits. Not the Grands version, just regular-sized buttermilk biscuits. These are the easiest breakfast for Christmas morning the whole family will go nuts over! Unwrap the biscuits and cut each biscuit into four pieces. You can quickly do this with kitchen scissors or on a cutting board with a knife. Melt the butter in one bowl and in a large freezer bag (or another bowl) combine the white sugar and cinnamon. Dip the biscuits in the melted butter, shake off the excess, and then transfer to the cinnamon sugar filled bag. Shake the bag until the biscuits are well covered in the cinnamon and sugar. Press 4-5 biscuit pieces into each muffin cavity. Make sure they are well pressed together. Bake for 10-12 minutes and then remove. Using a spoon gently coax the cinnamon roll pull aparts out of the muffin tin. While they are baking, beat together the cream cheese, vanilla, powdered sugar, and milk (if needed add more to desired consistency). Transfer the frosting into a plastic bag and cut off the tip. Pipe the frosting over the pull aparts. Cinnamon rolls are my favorite. I love that these take only 20 minutes to make. Definitely worth a try! I love quick fixes! These look so yummy! Pinned! haha oh gosh – packing and traveling like that always seem to have kinks in the plan! Always an adventure! And so awesome on Australia – I studied abroad there for a few months in college and LOVED it! These pull aparts sound awesome! Perfect for Christmas breakfast too! It sounds like an eventful journey! Hopefully the rest of your trip goes according to plan! I love the look of these pull aparts! Delish! Oh no, I’m sorry to hear about the truck not starting! Moving is so stressful but it will get better soon. And at least it will be an adventure to remember. I hope you guys have safe travels the rest of the way! And I’m always down for a warm gooey cinnamon roll, especially when I can pull off little pieces at a time. So much fun! You can’t beat how easy these are to throw together too. 20 minutes? You have me sold! I am craving a cinnabon cinnamon bun right now! These cinnamon roll pull-aparts are just genius! I love that I can have cinnamon rolls on the table in minutes when a craving hits. That is SO exciting that you are moving to Australia!!! Enjoy your new adventure! I love how this recipe only takes 20 minutes and cinnamon rolls are always good. These are waaaaaaaaaaaaay too easy for someone who loves cinnamon rolls. Sigh. I swear moving trucks are rigged to give up on you when you need them most haha! I experienced something similar when I moved 3 months ago from Scottsdale, AZ to Milwaukee, WI. Hopefully you have safe travels with no other bumps in the road! love the shortcut idea. Esp. around the holidays when there’s like serious time crunches going on. Looks awesome! LOVE this easy breakfast, Chelsea! I could totally get up before work and make these to take into work for the co-workers for breakfast! Safe travels to you. Hope everything works out with the truck and you’re able to be on your way. 🙂 Have a great Christmas and New Years, despite the traveling! These cinnamon rolls look incredible, Chelsea! I love that they take only 20 minutes to make and are pull aparts. So fun to eat, not to mention delicious, too! Pinned! Oh no! I can remember several family trips that were set back half a day thanks to malfunctioning vans. Bummer 🙁 In other news though, these look awesome! I’m all about 20 min and anything pull apart is just the bomb! These are beautiful! They look delicious and perfect for Christmas morning! You never cease to amaze me with your delicious treats!!! My family would flip over these and request them every day if I made them! Pinned! I can’t even imagine what all goes into preparing to move to Australia! I don’t know how you’re doing it! Safe travels for the rest of the journey! These cinnamon rolls look fabulous, wish we were having them for Christmas breakfast tomorrow morning. 🙂 Merry Christmas! fingers crossed that everything goes smoothly! These cinnamon roll pull aparts are genius-so tasty and easy!! I’m still SO impressed that you’re moving to Australia!! That so fun and crazy at the same time. I hope that all of your moving has gone well and you’re able to settle in to your new home (and kitchen!) really soon! And these cinnamon rolls… Pure bliss. I’d eat the whole batch. 😉 Pinned!